It's time for another Play Date Cafe Challenge! This week Mona issued the following color challenge: Light Green, Light Blue and Off White. Aren't these colors beautiful together! You can see her inspiration piece at the bottom of my post. I used the color palette to stamp the beautiful flowers from Kitchen Sink Stamps 3 Step Hydrangea and Multi Step Lilacs sets. Normally when I stamp using Kitchen Sink Stamps, I use three or more ink colors to stamp the images, for today's card I used just one color for the flowers and one for the leaves/stem (see color recipe below). The flowers were stamped on Vanilla card stock, then cut with an Oval Spellbinders Die. I sponged the edges with Chocolate Chip, then layered on a Chocolate panel that was cut using Spellbinders Labels Ten, then layered on a Bashful Blue Oval. This piece is layered on a beautiful piece of pattern paper by Donna Salazar. I just loved the elements on this piece, and cut it to include the wonderful sentiment. To coordinate with the paper, I added some Basic Grey Pearls, and a few punched Butterflies. If you've been following my last few Kitchen Sink Stamps projects, I've been including Videos to show how to stamp using these wonderful Multi Step Stamps. 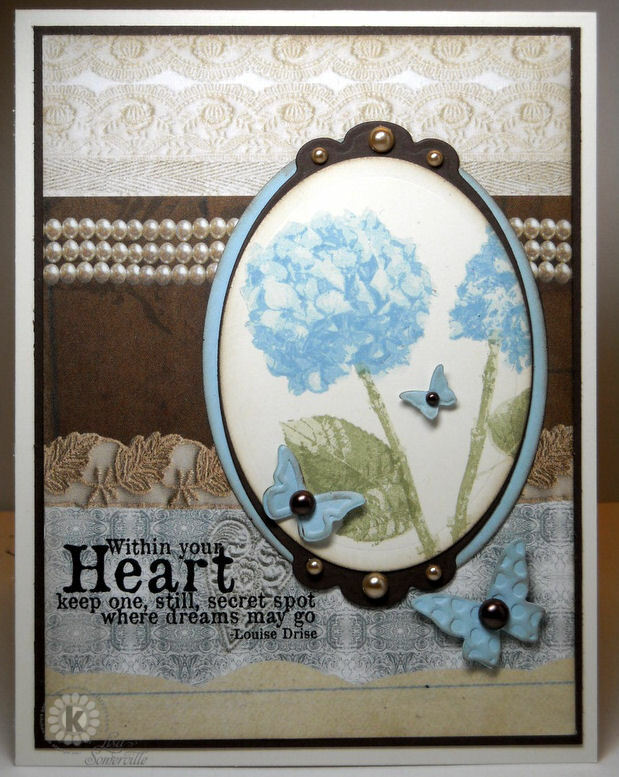 I don't have one for today's card, but I'll be posting one on Monday using the Kitchen Sink Stamps 3Step Hydrangea, so be sure to check back. What an elegant card Lisa! Those big stamped flowers are beautiful & the pearls look so beautiful! Thanks so much for making this week's colors look so wonderful! Gorgeous! Love that touch of lace in the background and the rows of pearls are fabulous! Love hydrangeas and yours is no exception! This gets 5 star rating! Luv this card! Sweet eye candy! beautiful!!! Love the brown tied in with these colors. Gorgeous creation, Lisa! Love those flowers -- they are life-like!! You are so talented! This is just beautiful..so soft and pretty! I love this beautiful card- I love the layout and those stamps are so pretty! Goodness that's beautiful Lisa!! You may have just convinced me I need to buy that stamp!! Thanks so much for letting me play along with your girls the past 2 weeks! I've had so much fun! Pretty card Lisa. Love the colours. So elegant Lisa! I love the way you've done the little pearls on the border, and the butterflies look beautiful hovering around. Lovely!!! So pretty! I just love Playdate Cafe. They have the most wonderful color challenges.